Need an expert arborist in North Shore? North Shore Arborists – Stump Grinding and Tree Removal . With years of experience in arboreal care, Jim’s Trees’ team of fully trained and qualified arborists are here to take care of all your tree care and maintenance needs. Based in Auckland, we pride ourselves on our exemplary service and providing honest and careful advice that you can trust. Tree trimming, tree removal and stump grinding all involve a high degree of risk for both the arborist and the property owner. It is essential to hire a qualified and insured arborist to undertake the task. At Jim’s Trees, we are the Auckland arborists that you can trust! Our staff are professionally certified and adhere strictly to industry guidelines relating to safety in the workplace. They have the relevant qualifications and training to give you the peace of mind that the work will be carried out with skill, care and safety. Think of an arborist as a surgeon of trees! An arborist will have the correct knowledge and expertise required to maintain and care for trees and other woody plants. Whether it is to prune, treat decay or even re-plant, our team of Auckland arborists will know how to do the job safely and correctly so there is no damage to the tree at any time. Carrying out work such as tree removal and stump grinding can pose a high degree of risk so make sure to hire a trained professional. Our Auckland arborists have the correct skills and equipment to keep you and your property safe. Need a certified and insurance arborist in North Shore? It is always good to know that you will be getting a quality service for your money. A certified arborist will have gained their skills through certified arboriculture programmes and professional on-field training. At Jim’s trees we are proud to have professional arborists on staff who truly understand what trees need to do well, having years of experiences in providing tree care and maintenance of all kinds. 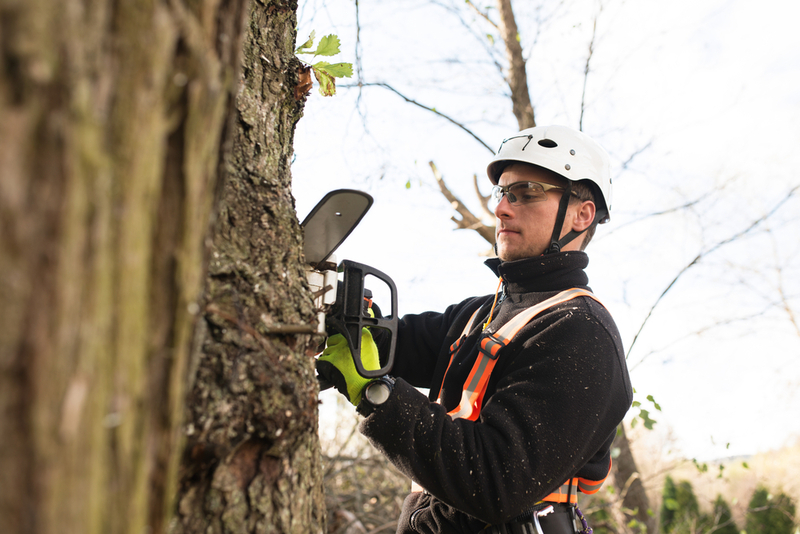 All of our Auckland arborists have the necessary training to carry out their jobs with exemplary performance and skill. Our team are able to quickly and safely prune, trim or reduce your trees to allow them to reach their full potential and ensure that your green spaces are in good hands. How can Jim’s Trees help you? At Jim’s Trees, there is no middle man or contractor to deal with, so you know you are receiving quality work every time. Above all else, we value the service we –provide to our customers, insuring that their needs are met and that they are satisfied with the work we do. Services in sensitive locations such as close to power lines etc. As a responsible organisation, Jim’s Trees understands and recognises the need for safety in regard to our clients, their properties and our staff. Our comprehensive safety policy sees us comply with the strict legal OHS guidelines in every job we undertake, no matter how big or how small, and we continually seek to adopt the best preventative measures to ensure a safe workplace. We also have an industry leading insurance cover policy that is there to give you peace of mind and cover the cost of any potential damages to your home. We offer a $10 Million insurance to safeguard your assets which is applicable to all of our services. Read more about our strict OHS policies and insurance coverage here. Whether you are in need of residential, commercial or agricultural arboreal services, at Jim’s Trees our Auckland arborists will have their expert knowledge and training on hand to provide you with a high quality services. Ranging from Auckland tree trimming and tree removal to stump grinding and arboreal inspections, if you require the services of an Auckland arborist, then get in touch with the team at Jim’s Trees today either online or on 0800248733 for a free, no obligation quote. You can also use the free quote form on our site to receive an estimate.